Missing Trey Gowdy Investigators Found Dead, Gowdy in Protective Custody-Fiction! - Truth or Fiction? Investigators working for U.S. Rep. Trey Gowdy (R-SC) on a criminal investigation of former Secretary of State Hillary Clinton went missing and were later found dead, and Gowdy himself has been taken into protective custody. An admitted fake news website is behind a series of false reports that investigators working for Trey Gowdy went missing and were later found dead. The incident in Arkansas is just the latest in a vast conspiracy to cover up crimes by one of the most corrupt families in human history. No, we have no evidence. There’s never any evidence. What we do have, however, is a mole. Someone inside my own committee cost those men their lives by leaking their travel plans. I intend to find out who that mole is and have them waterboarded as an enemy of the state until they give up their boss. Gowdy is clearly at the end of his rope. To insist on enhanced interrogation means he believes the perpetrator is an enemy combatant. That’s going to put a lot of pressure on the family in question to cover their tracks. Hopefully nobody else needs to go missing. In reality, Trey Gowdy chaired the House Select Committee on Benghazi, which was tasked with investigating 2012 attacks carried out on two U.S. facilities in Benghazi, Libya, that left four American officials dead. The investigation largely focused on the role of Hillary Clinton, who was secretary of state during the attacks. The committee concluded its investigation during the summer of 2016 and released a final report in December 2016. 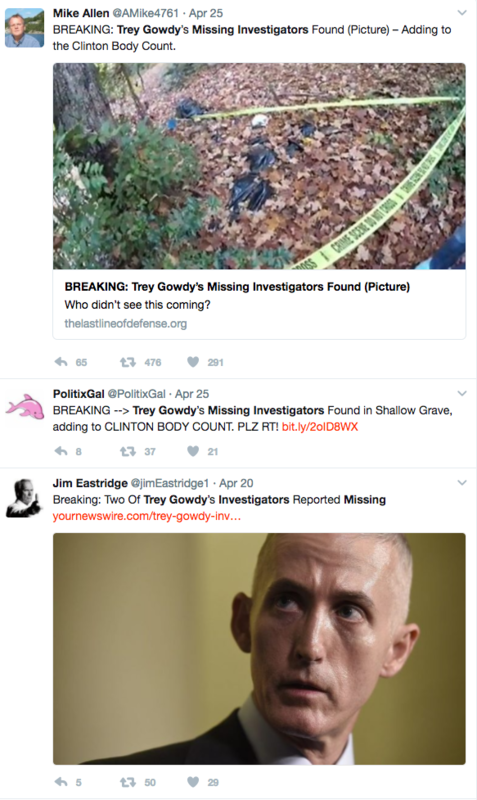 False reports that investigators working for Trey Gowdy went missing and were later found dead were started by a fake news website. Bill Clinton Suffers Health Crisis, Family Rushes to Arkansas-Fiction!